Apple is going rogue when it comes to beta releases; its been only two days since they released the first beta of iOS 5.0.1, and already, the second beta has been pushed out to developers. But, thankfully, it is jailbreakable using the existing version of Redsn0w. This jailbreak, like any other iOS 5 jailbreak, is limited to tethered boot for now. We’ll go through the routine of explaining what a tethered jailbreak is; well, if you jailbreak your iPhone, iPad or iPod touch on iOS 5.0.1, and you are faced with a situation in which your device loses power or restarts, you would have to connect it up to your PC or Mac and boot it into the jailbroken state, every single time when that happens, otherwise you’ll be stuck in the dreaded Apple logo boot loop. But keeping that in mind, a tethered jailbreak is better than no jailbreak at all, right? Moving on, the current release of Redsn0w, which is version 0.9.9b8, can easily jailbreak iOS 5.0.1 beta 2. As mentioned by MuscleNerd in the tweet above, simply point Redsn0w to the iOS 5.0.1 beta 1 firmware file before you go ahead with the jailbreak, its that simple. But, we’re expecting an update from the iPhone Dev Team for Redsn0w, which would recognize the iOS 5.0.1 beta 2 firmware directly, something which it can’t do, currently. The steps for jailbreaking iOS 5.0.1 beta 2 are the same as those posted here. Be sure to select the iOS 5.0.1 beta 2 firmware file where necessary, and not iOS 5.0.1 beta 2. Although, the jailbreak is tethered boot for now, but you can achieve a semi-tethered jailbreak by simply installing a tweak from Cydia called SemiTether.The tweak allows you to restart your jailbroken iPhone, iPad or iPod touch without having to connect it to your PC or Mac, but there’s one catch; some of the apps will seize work. 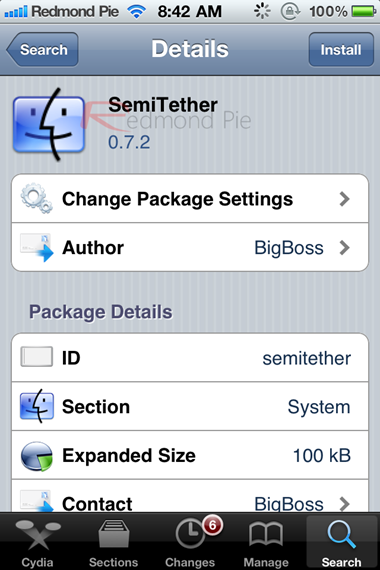 You can follow the instructions posted here on how to download and install SemiTether on your jailbroken iOS device. Those of you who are interested, you can check out the progress on jailbreaking iOS 5 untethered here.